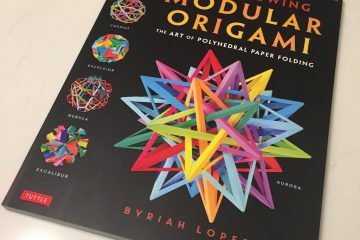 I first laid my eyes on an artwork of Benjamin John Coleman on Origami Caravan website, over a year ago. He was auctioning off an original work of his, which was a wall hanging of intricate origami flowers. It looked very organic and sculptural, unlike most other origami flower models. I loved it. You can still see the photo of it here: “Outcropping II” by Benjamin John Coleman. So when I acquired the Origami Bonsai Kit by Benjamin John Coleman, I was very excited. 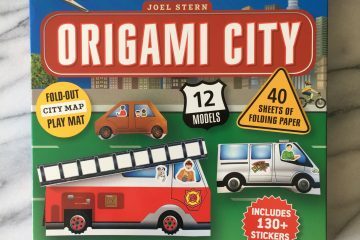 This kit comes in a box with a full-color instructional book, a DVD, and folding papers in a variety of colors. In the book, the author uses his own diagramming system called Glow-fold, instead of the traditional Yoshizawa-Randlett system which I’m very much used to. Because of that, I needed to read the book a little more carefully than usual and get used to his own way of explaining the steps. There are four types of simple yet attractive leaf models. As for flowers, there are six varieties that are all very intricate and beautiful. Five out of the six flower varieties start out from the same base model. The last step of the basic flower form was a bit challenging for me, but luckily I got help from a friend. The DVD is also a great resource for a time like this. Aside from that small learning curb, I was able to fold all models with no problems. The kit comes with folding papers in a variety of colors, a bit grossy and printed on both sides. I love the subtle gradations of bright colors. These printed papers give crease marks that are visible, as you can see in the photo below. (left to right, top to bottom). The crease marks look fine on leaves, but I was not fond of how they looked on flower petals. Because of the crease marks that I couldn’t seem to avoid, I used these printed papers only for practice. For actual display pieces I chose to use washi. I love the matte, soft texture of washi. I have a good variety of washi at home. The author says he paints the papers for his own creations, so that might be another option. After folding flowers and leaves of my choice, with the papers and colors I like, even more fun comes next: finding a twig (and a stone) for the sculpture and assembly. The author suggests to use an actual twig to attach to folded flowers and leaves: something that I had never thought of doing. I’ve made a lot of origami flowers in the past but always used floral stem wires or pens/pencils with floral tapes around them to attach the origami flowers. I found that using a real twig is much more elegant choice. The author also talks in detail about leaf alignment and perspectives of sculptures, which really helped me figure out how to make it look more like a real plant. As suggested by the author, I used a hot glue gun to attach the folded pieces to the twig. I actually didn’t own a glue gun before, but I picked up a seemingly good quality one from SCRAP for just $2! I was very happy and excited to see how organic and natural my first origami bonsai sculpture turned out. I picked the combination of Primrose and Foxglove in pink and red: my favorite colors. I can’t wait to make more of these origami bonsai sculptures as center pieces for our Thanksgiving dinner and for holiday decorations. Perhaps I could also give them out as holiday gifts. I think this kit itself makes a great holiday gift to people who loves craft projects as well! 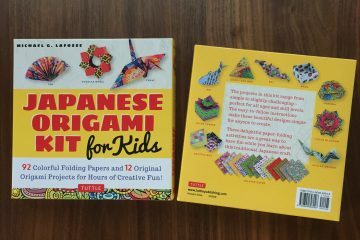 Origami Bonsai Kit is available to buy on Amazon, Powell’s, and many other book stores. Yuki Origami Ⓒ 2019 All Rights Reserved.